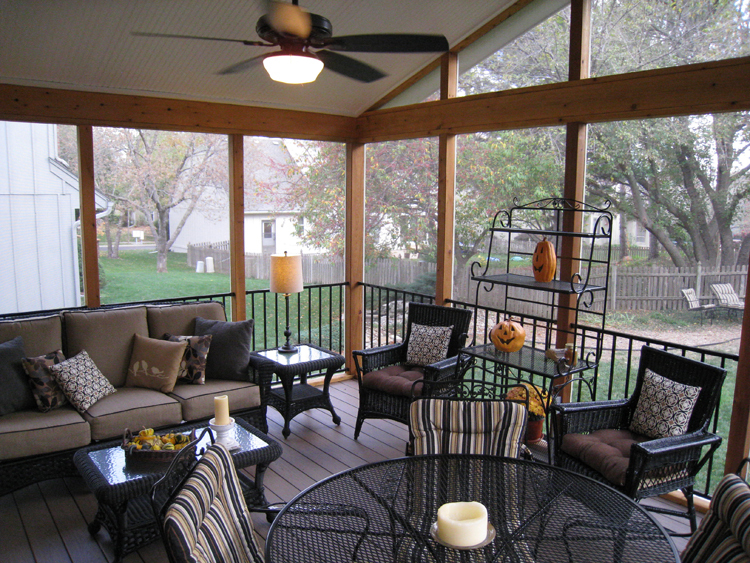 When we first met these Lenexa KS homeowners at a home show, they had an older existing deck and were looking to replace it with both a covered and uncovered outdoor living space. As you can see in the photo above, the home improvement made a dramatic change both aesthetically and also functionally for the home. The old deck spanned most of the back of the home. The homeowners wanted to split that space to include both a porch and a deck. One of the challenges we often have in designing a screen porch to attach to a home is deciding where to attach the porch to the home. Often, second story windows obstruct the area where we hope to attach the roof of the new porch. There are usually a few ways an experienced contractor can work with the configuration of your home. At this home, the owners agreed to replace the second story window with a smaller window to allow room for the gable roof over the screened porch. If you look at the top right of both the before and after pictures, you will see how the shorter window allows space for the screened porch roof. The homeowners knew they wanted low-maintenance flooring materials and after consideration they selected AZEK Sedona for the flooring and black Fortress steel railings to enhance view. Slim black railings are a popular choice. Both because of the color black and also because of the slender width, the eye tends to travel beyond the railing to focus on the yard instead of the eye focusing on the railing itself. 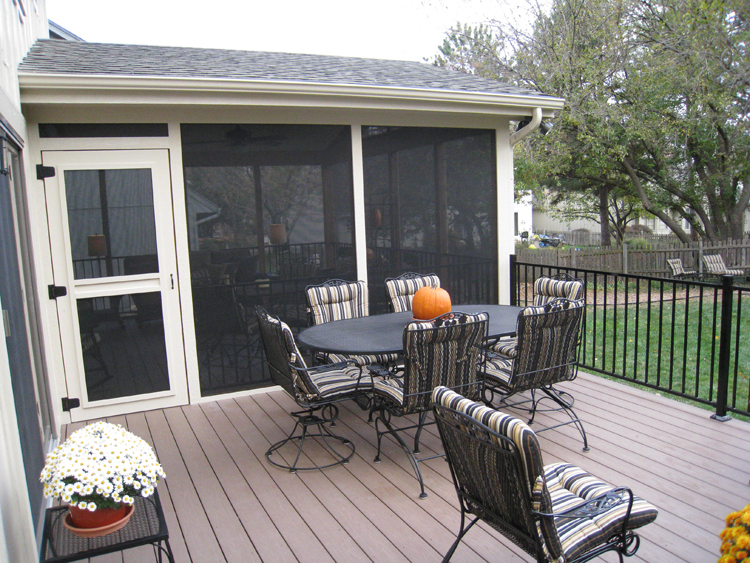 The owners continued the AZEK decking and the same Fortress railing throughout the screened porch as well. Many owners select a gable roof design as you see above. With a gable roof, both sides of the roof meet in the middle crating that triangular end shape. Many of our customers screen the gable area to allow more light and more air into the porch. You’ll notice in this picture that the beautiful black furniture compliments the brown flooring and especially the black iron railings. These homeowners’ furniture was between 30-80 yrs old and was willed to them. They sent the furniture off to be refurbished and repainted and it finishes this picture perfect porch. If you are considering adding a porch, deck, or other outdoor living area to your home, give us a call at (913) 851 – 3325 or send us an email at kansascity@archadeck.net. We look forward to hearing from you. This entry was posted in AZEK, Composite woods, Screen Porches and tagged Archadeck of Kansas City, Deck builder Lenexa KS, Lenexa KS AZEK deck, Lenexa KS porch builder, Lenexa KS screened porch, screen porch Kansas City on November 6, 2012 by archadeckkansascity.